In times of crisis and scarcity, company concerns are felt more acutely. The questions how to produce more efficiently using fewer raw materials, less energy, less water, less labor, less capital, less equipment, and with less impact on the environment, society and the individual, are all asked. The analysis of performance and, therefore, of production efficiency can be carried out from two complementary points of view. Macro performance analysis evaluates the impact of production on the environment and to the shareholder, while micro performance analysis evaluates the impact on operations. 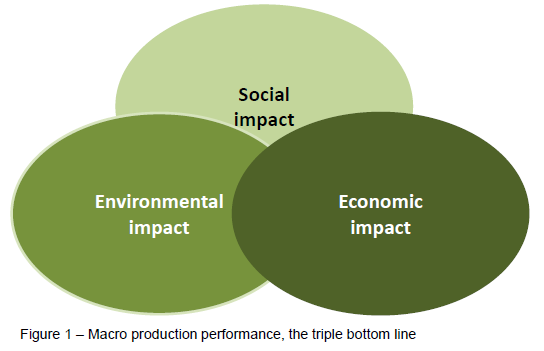 To analyze production performance from a macro perspective, the “triple bottom line” — people, planet and profit — is often used: social impact, environmental impact and economic impact, as seen in Figure 1. It is based on the premise that companies should be evaluated not only on profits generated for shareholders, but also on the impact on society and the environment caused by their operations. Companies know that when they produce, they impact society, and they should seek to mitigate the social consequences of their activities. One way is to create jobs and adopt labor practices that allow people to contribute via their individual skills. Another is to deal honestly and transparently with employee representatives and other societal entities. Reducing environmental impact, i.e. improving environmental sustainability, means ensuring that production output will protect rather than harm the environment and foster further business development. Environmentally sustainable activities preserve the functions and components of the ecosystem in a sustainable manner and engage in appropriate practices in all areas of activity. The goal is to achieve development in all economic sectors, e.g. agribusiness, industry and services, without compromising environmental integrity. Lastly, the economic impact, which must ensure the correct use of production resources, so as to provide a return to shareholders. 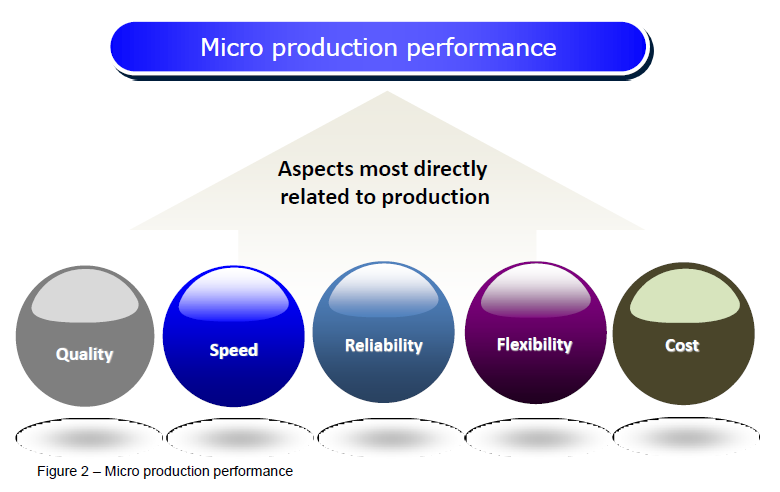 Production performance from the micro point of view is analyzed against so-called operational performance objectives, also called competitive criteria, which enable superior analysis of the supply of products and services against market and customer demand. Typically, five operational performance objectives are used in production management that relate to business strategy: quality, speed, reliability, flexibility and cost, as seen in Figure 2. Quality means doing it right the first time, without scrap or rework; the consequences are cost reductions and increased reliability. Speed means making a product or service available before competitors do, thereby improving the chances of making a sale and reducing inventory accordingly. Reliability gives customers the confidence that the company will satisfy their needs. Through reliability companies save time and money and achieve stability through customer loyalty. It also makes it possible to reduce inventory. Flexibility gives companies the ability to change — this can be in product / service, mix, volume, and delivery. Flexible companies respond better, save time and guarantee reliability. Lastly, cost. The lower the cost, the lower the price point and, therefore, the more competitive the company becomes. Ready to evaluate and improve the performance of your company’s systems and production processes vis-à-vis macro and micro performance aspects?